Water fluoridation is flavour of the month again for anti-science conspiracy theorists who consider it mass-medication or in the case of Rusty Kage, sorry Kane, mass poisoning. Anyone for a root canal? Rusty? The US Centre for Disease Control ranks fluoridation of water number 9 on its top 10 list of the greatest public health achievements of the 20th century. From the CDC: Fluoridation of drinking water began in 1945 and in 1999 reaches an estimated 144 million persons in the United States. Fluoridation safely and inexpensively benefits both children and adults by effectively preventing tooth decay, regardless of socioeconomic status or access to care. Fluoridation has played an important role in the reductions in tooth decay (40%-70% in children) and of tooth loss in adults (40%-60%) (5). Didn’t do much for me – I grew up with fluoride in the water and toothpaste, brushed regularly, didn’t have excessive sugar intake, but still have crap teeth. Don’t seem to have major immune damage or osteoporosis yet though, but I guess there’s still time 🙂 What’s the primary scientific defence against the claims of side-effects? Is fluoride not actually toxic, or are the doses too low in practice? Or something else? “Fluoridation opposition is science-based and growing,” says Paul Connett, PhD, FAN Executive Director, who has co-authored the upcoming book, “The Case Against Fluoride: How Hazardous Waste Ended Up in Our Drinking Water and the Bad Science and Powerful Politics that Keep it There.” Co-authors are James Beck, MD, PhD, professor emeritus of medical physics at the University of Alberta in Calgary; and Spedding Micklem, DPhil, professor emeritus at Edinburgh University. “We have spent many years investigating water fluoridation and the toxicity of fluoride and we are dismayed that commentators are willing to repeat, without verification, pro-fluoridation statements that disparage scientists and citizens who oppose the practice,” says Connett. The “crazy letter” uses the standard emotive ploys resulting in a very poor argument. 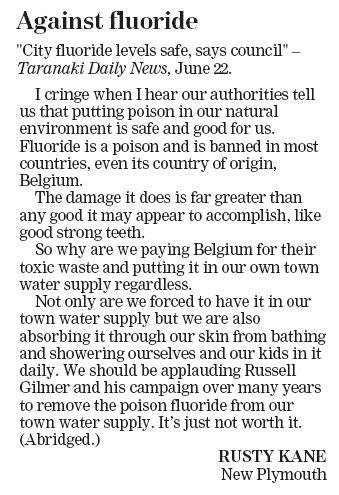 From what I have read fluoride is not banned in Belgium, they just choose not to use it. (banned is a much more emotive and fear provoking term I guess). I’d also be very surprised in fluoride can be absorbed through the skin. The website links provided by nyscof apply a scattergun approach in trying to bring together all refernces that might even remotely imply that fluoride is harmful/has no benefits. I find this approach unscientific. It would make much more sense scientifically to pull together the most conclusive pieces of research to make a case against fluoridation. In considering the claim that Time had fluoride on its top 10 list of household poisons one does need to consider what form the fluoride takes and what the toxic dosage is. Even vitamins can be toxic at certain dosages. the NRC reported it is too high and must be lowered but the EPA has yet to act upon this. At least three members of the NRC’s fluoride panel believe that, based on the science revealed in the NRC report, fluoride levels in drinking water should be as close to zero as possible – which would effective kill the fluoridation program in the US which is probably why the EPA is overdue in its mandated fluoride review. Unfortunately, politics plays a heavy hand in fluoridation which never was rooted in valid science. Thanks for pointing out the NRC report, most enlightening. There is a freely-available NZ Excel spreadsheet of school dental health monitoring that can present data based on Fluoride / non-fluoride, as well as other parameters. The greatest benefits are usually obvious in children. I recommend the 1990 – 2008 time series data, select Multiple Time Series data, DMF, and switch between F and Non-F. The benefits have been, and still remain, obvious, however the concentration in water may require regular fine-tuning ( usually a decrease ) . The more fundamental question is whether providing supplemental Fluoride in the water is the best option. In some countries, for historical reasons, Fluoride is delivered via salt, toothpaste, etc.. I believe that fluoridation of water should continue until alternative Fluoride delivery systems are shown to be as effective in protecting the population, if not more so.